A tension-free vaginal tape is an operation used in the treatment of stress urinary incontinence. In this procedure, a synthetic tape is placed around the urethra to form a sling – this supports the urethra to prevent leakage. Short term cure rate (up to one year) has been reported to be 71-97% and long term cure rate (up to 5 years) is 51-88% in the Cochrane systematic review on mid-urethral slings [Ford AA, 2015]. In this article, we shall look at the procedure, indications and complications of a tension-free vaginal tape. Local anaesthetic is inserted into the anterior vaginal wall over the area of the mid-urethra. A small incision is made in the anterior vaginal wall, and tissue is dissected on either side of the urethra. A mounted catheter is inserted into the bladder to manipulate the bladder during tape insertion. The needle with the tape attached to it is inserted into the dissected tissue along the metal catheter guide and is inserted through the retropubic space along the back of the pubic symphysis (Fig 1a). The needle will emerge suprapubically onto the abdomen (Fig 1b). The mounted catheter is then removed. Cystoscopy is performed to check there is no bladder perforation. The tape is then adjusted bilaterally, ensuring that it is not too tight over the mid-urethra (Fig 1c). The incision on the anterior vaginal wall is closed up with dissolvable sutures. Fig 1 – Stages of a tension-free vaginal tape. 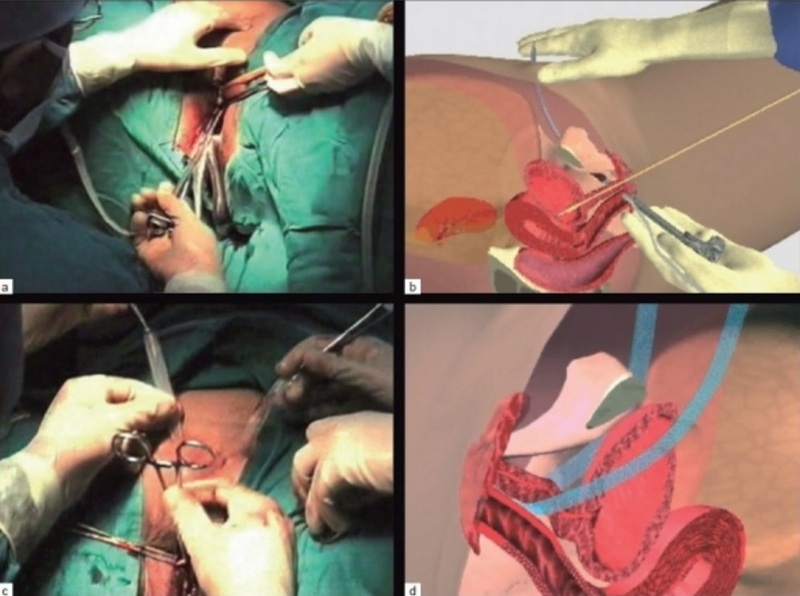 (a) TVT needle insertion on left side, with catheter and metal guide on same side, (b) Schematic insertion of TVT tape, (c) Adjusting tension free TVT, (d) Mechanism of action of mid-urethral application TVT. A tension-free vaginal tape is used to treat stress urinary incontinence. This typically presents with involuntary leakage of urine on exertion or when sneezing or coughing. The management options are dependent on the patient’s choice, lifestyle and suitability for an operation. Conservative options such as lifestyle modifications and physiotherapy are typically offered prior to medication or surgery. In the UK, surgical management should be considered if there is demonstrable urinary stress incontinence or urodynamic stress incontinence. Urodynamics testing and MDT discussion is recommended for patients with previous surgery, failed treatments, mixed symptoms and/or high risk for surgery. Damage to pelvic blood vessels or viscera. National Institute of Health and Care Excellence (NICE), 2014. Urinary Incontinence in women: management. London: NICE. Ford A et al, 2015. Mid-urethral sling operations for women. Cochrane Database of Systematic Reviews.